Jamie Edmiston of Edmiston & Company writes in with the news that he and Nathan Farrelly have been appointed joint central agents, with Merle Wood and Peter Croke of Merle Wood & Associates, for the sale of Austal's 58.8m superyacht Outback. Nathan, who has been involved with this superyacht since her launch in 2007, comments: "With accommodation for 14 guests in seven double cabins, Outback was designed as a luxurious beach house. She has huge open areas, a 35m upper deck and floor to ceiling windows to let the natural light and warmth flood in." 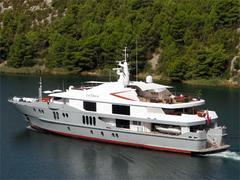 Equipped with a vast array of sports and leisure accessories, she's on the market at $39.9 million.